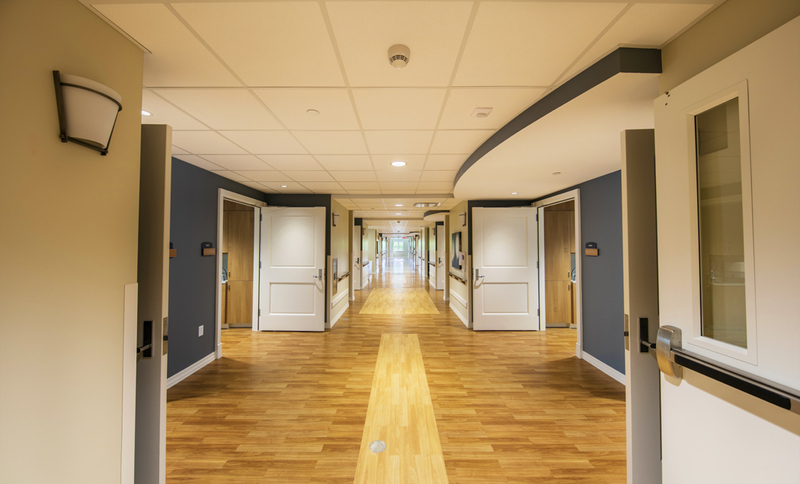 This is the second installment of our blog series focused on designing spaces that meet the unique needs of dementia patients. Read part one. Alzheimer ’s Disease and Related Dementia, also known as ADRD, affects more than 5 million people in the United States, according to the Alzheimer’s Association. 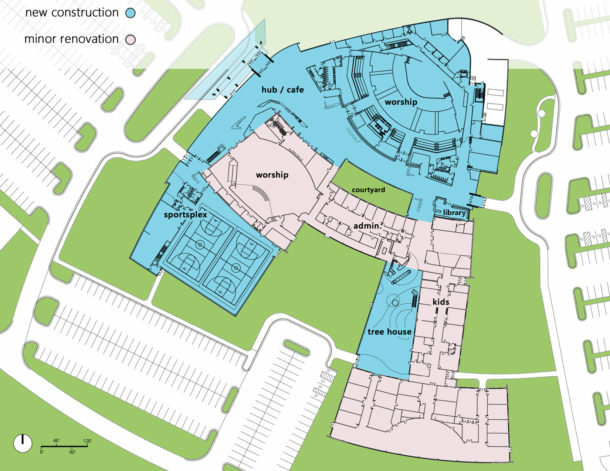 By 2025, the number of people age 65 and older with Alzheimer’s disease is estimated to reach 7.1 million — a 40 percent increase from the 5.1 million age 65 and older affected in 2015.1 Designing facilities that meet the needs of ADRD patients will be an important differentiating factor for facilities as this unique population continues to grow. ADRD causes people to interpret the world differently than those around them. Their interpretation is different from you or I, and it is different from other seniors. Understanding this helps us realize that ADRD has consequences for how people understand the world through their five senses. Designing for these differences means understanding how the brain works and how design choices can positively influence a person with dementia. Senior Electrical Engineer Sarah Gengelbach has been designing lighting for senior living, memory care facilities and healthcare facilities throughout her career. 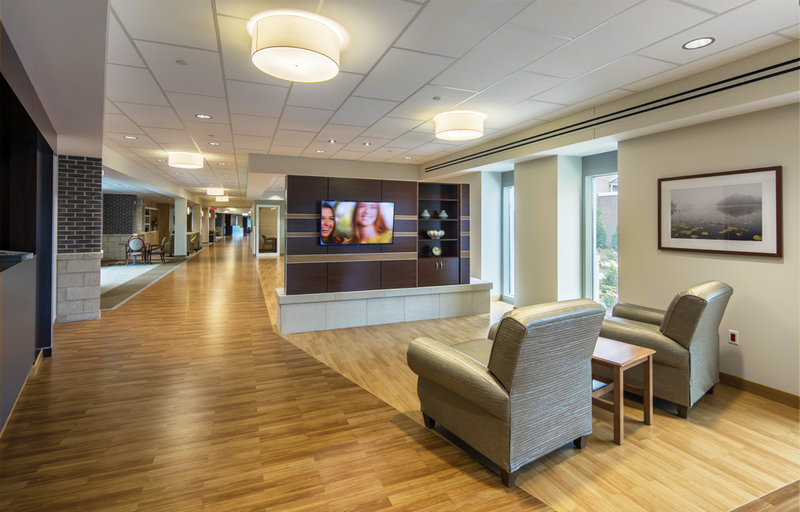 Her experience with memory care residents has led her to seven key points when designing lighting for people with dementia. 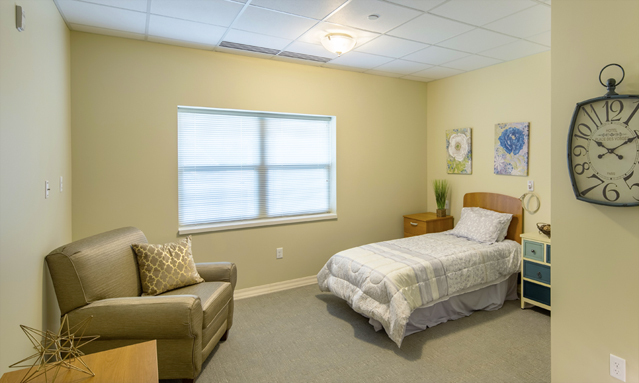 One of the most important things to think about when lighting a memory care facility is the elimination of light and dark spots throughout a space. Dark spots can feel ominous to the brain and may cause distress to residents. Even and consistent lighting will help residents move more easily throughout a space. 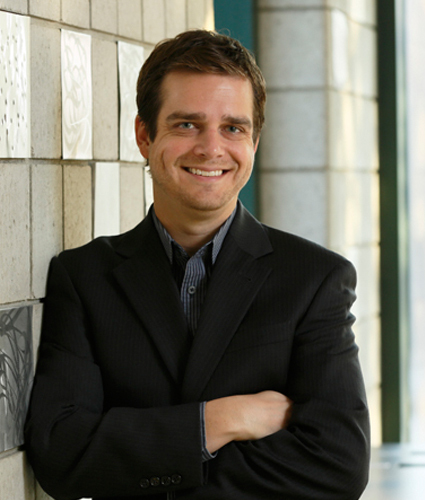 Making sure lights are evenly spaced, and are providing the right amount of light, is key. Dark spots in a room can appear ominous to people with dementia. Light should evenly fill all parts of a room. The color of light is often not considered when designing for dementia. However, it can arguably be one of the most helpful hints to the body’s circadian rhythm. Our bodies are wired to react to the natural light and this same reaction can be recreated using artificial lighting. Warm reds and oranges in the morning help imitate the sun and wake up the body. White light at midday exemplifies the sun at its brightest. Repeating red and orange light again at night can help mimic the sunset and help the body settle into sleep. A long hallway, which might typically appear dark, is brighten by adding natural light at the end and sufficient artificial lighting throughout. This makes the hallway more welcoming and easier to navigate. Reducing glare is important in any space. Glare is uncomfortable and can be disorientating, even for those not affected by dementia. Glare can be reduced in a number of ways including having non-reflective surfaces and even spacing in lighting. Choosing fixtures that hide the light source will also help to greatly reduce glare. Providing access to natural light, whether it’s with secure outdoor spaces or just additional windows, will help maintain well-being and assist the natural rhythms of the body. Views outside of windows should be considered. For example, a window that looks out to a bird feeder or the woods are more likely to promote positive stimulation and memories than a parking lot. 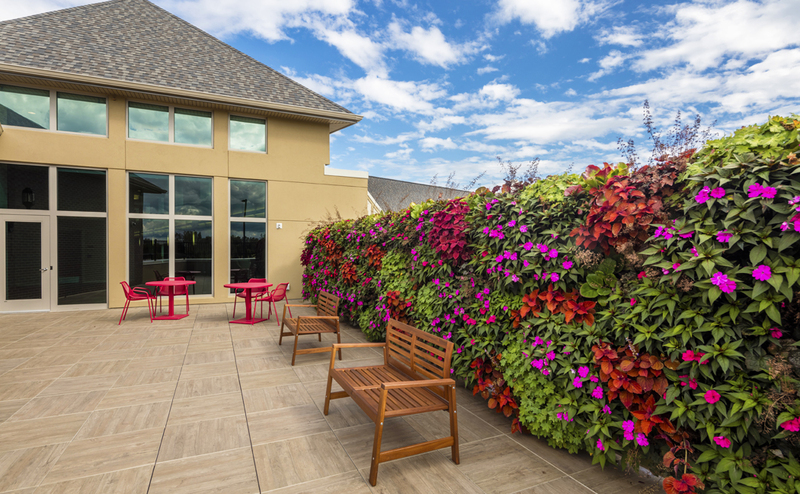 A “Living Wall” allows residents to enjoy the natural beauty of a garden while also adding security to an outdoor space. Dementia patients need clear signals from the outside world to help them maintain a regular circadian rhythm. Bright corridor lights outside of their bedrooms are confusing to their natural rhythms and may cause an inability to sleep. 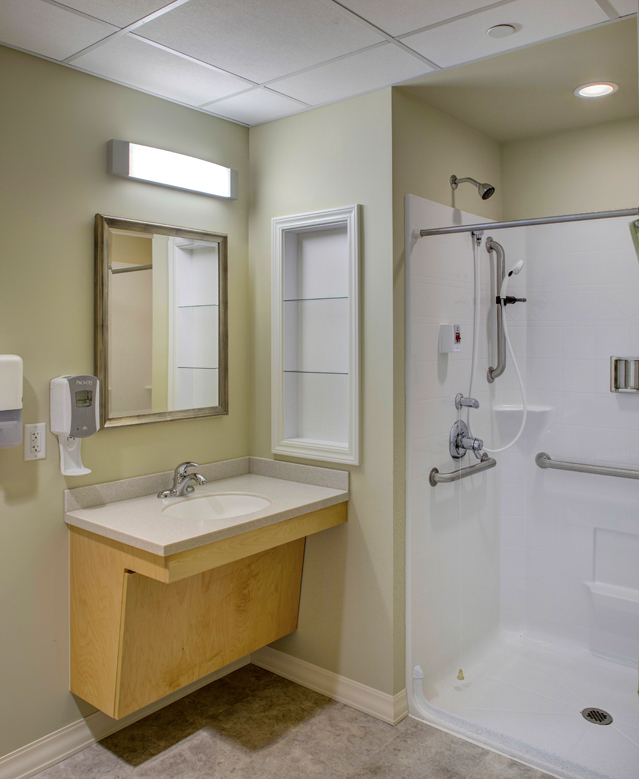 That being said, warm lights, such as yellows and reds, should be provided during the night as a way for residents to safely make their way to the bathroom and maneuver throughout their room. As with age, dementia only sharpens the need for brighter, more direct light when someone is performing a task. Whether that’s a word puzzle, knitting, reading or even shaving in the bathroom, brighter light that removes shadows should be provided. Task lighting above the bathroom sink makes it easier for residents to perform daily tasks like brushing their teeth and shaving. Good lighting can help dementia patients by allowing them to easily see what is around them. Being more aware of their surroundings help them to identify signs, see other’s faces and even make them more willing and able to participate in activities. On the other end, poor lighting can actually increase anxiety as they may cause a sense of insecurity about what’s around. 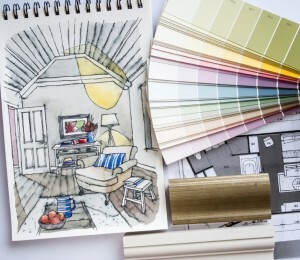 Our Senior Living team is in the middle of designing a memory care cottage on Michigan’s east side. At the start of this project we placed lighting at the top of our list, as one of the most important items we needed to consider. Our hope is to add to, and not detract from, the overall resident experience and enable residents to feel empowered to explore their environment while remaining safe. 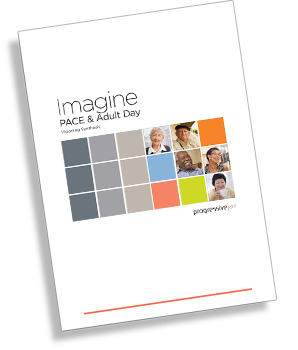 Interested in learning more about designing for memory care residents? Learn about the importance of thermal comfort and how it uniquely affects people with dementia. Hebert LE, Weuve J, Scherr PA, Evans DA. Alzheimer disease in the United States (2010–2050) estimated using the 2010 Census. Neurology 2013;80(19):1778–83.